City Hall is famous for stringing us along, so here's our chance to return the favor -- and in the process become an entry in the Guinness Book of World Records. 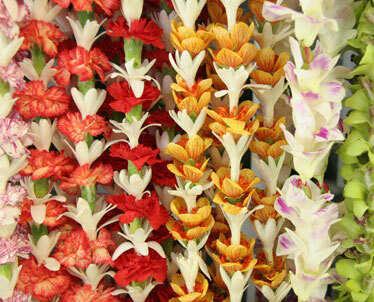 Here's the deal: May Day is Lei Day in Hawaii; that's a given. Thursday is the 81st annual celebration of the holiday, and the city wants to create the world's longest lei that day in Kapiolani Park. We're talking at least a mile in length. This will take a minimum of 1,800 leis, so they need donations of leis, and volunteers to hold up the final product. » String a lei that measures 36 inches from flower tip to flower tip. Leave it untied, with at least 6 inches of string at each end for tying. Use durable thread. » Use any type of fresh flower. No paper, leaves or fake flowers, and no non-natural materials or artificially treated materials, except the string. » Be sure the lei can be handled, tied and moved without falling apart. » On Wednesday from 9 a.m. to noon, bring leis to the Honolulu Hale Courtyard or to Kapolei Hale, Room 309; or from 1 to 6 p.m. to Kapiolani Park, Kalakaua Avenue Tennis Courts. On Thursday, leis may be delivered from 7 to 8:30 a.m. to Kapiolani Park. Call 768-3040 or visit www.co.honolulu.hi.us/parks/programs/leiday/index.htm. A mile long lei will be strung at Kapiolani Park for the 81st annual celebration of May Day. Ruth's Chris Steak House in Restaurant Row showcases Tinchero Wines in a Winemaker Dinner tomorrow. Chef Kyle Yonashiro's menu starts with a lobster salad and Bacon-Wrapped Ahi Mignon, followed by a bone-in beef tenderloin. Cost is $85. Call 599-3860. The Pineapple Room celebrates Cinco de Mayo with a Winez & Grindz menu on May 5. The menu by sous-chef Robert Urquidi and general manager Gary Matsumoto includes such pairings as Pan-Seared Diver Scallop with Chorizo Meatballs and Clams, and Coffee- and Spice-Rubbed Beef Filet with Crab-Filled Chile Relleño. Cost is $65, $90 with wines. The Pineapple Room is in Macy's Ala Moana. Call 945-6573. Hoku's in the Kahala Hotel & Resort puts the focus on Kobe beef with a five-course set menu offered tomorrow through May 5. Chef Wayne Hirabayashi's menu includes Grilled Kobe Rib Eye Steak, Kobe New York Beef Carpaccio and Pan-Seared Kobe Beef Tenderloin. Cost is $190. Seatings are from 5:30 to 10 p.m. Call 739-8780.